Dingwell Bros., 1017-25 Greene Ave., Brooklyn, N.Y. The business was first listed in the 1908 Brooklyn City Directory as Dingwell Brothers, waters, located at 1025 Greene Avenue. The business was listed in the Copartnership and Corporation Directory of the Boroughs of Brooklyn and Queens 1913-1914 as Francis S and Henry C Dingwell, 1017 &1025 Greene Ave. It looks like the Dingwells sold the business sometime in 1917. An article in the July 1917 1ssue of the “American Bottler” stated that Dingwell Brothers has been incorporated with a capital stock of $10,000 to manufacture soda and mineral water. Incorporators are Martha Rosenberg, Abraham Sussman and Max Sussman. Several months later on November 18, 1917 Henry Dingwell passed away. Dingwell Brothers was one of many Brooklyn and Long Island Bottlers of Beverages that “patriotically contributed” advertising space in the June 27, 1918 edition of the “Brooklyn Daily Eagle”. 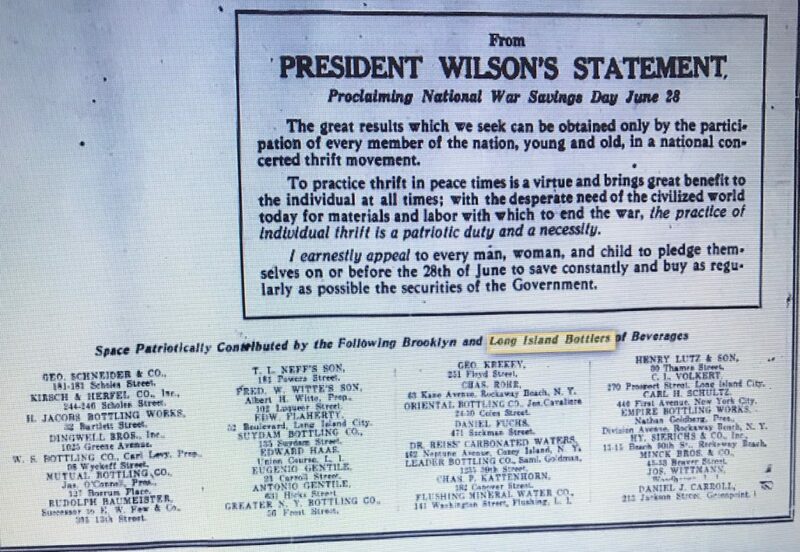 The advertisement contained a plea from Uncle Sam to Brooklynites to sign a pledge card to purchase war savings stamps to fund the war effort. By 1925 the business had moved to 62 Stanhope Street. It looks like the business remained active, at least into the mid – 1940’s. A 1945 classified ad by Dingwell in the Brooklyn Daily Eagle was looking for Route Men for bottle, beer and soda runs. At that time, they were still located on Stanhope St.
Today, Greene Avenue in this area still exhibits old one-story buildings with garage type door openings that could have been used by the Dingwell facility. 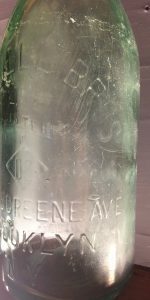 The bottle I found is a machine made quart (28 oz) with the Greene Ave address. It dates no later than the mid-1920’s when the company moved to Stanhope Street. Wm. Dieckman & Son, 59-63 Stockholm St., Brooklyn N.Y. In 1878 he began the manufacture of mineral water at No. 125 Elm Street, there conducting a successful business until 1884 in which year he purchased the three lots at No.s 59, 61 and 63 Stockholm Street. There he erected the dwelling and other buildings used in his manufacturing business and in addition he secured the accessories and other conveniences for the successful operation of his trade. In his undertaking he has prospered and the volume of his business is constantly increasing. The early Brooklyn City Directories confirm and add a little to the story. William Dieckman was first listed in the 1880 Directory at 125 Elm Street. He was also listed as pop/beer and vinegar in the 1883 and 1884 Directories respectively. By 1886 he was listed at the 63 Stockholm address as vinegar and by 1890 he was listed primarily as a bottler of soda and/or mineral water. During these yearly years he was sometimes listed as having two n’s in his last name. Around 1899 the son, also William, becomes associated with the business. The 1899 Trow Business Directory refers to the business as Wm Dieckman and Son and the 1902 General Directory lists both William and William Jr at the Stockholm Street address. Sadly, William Jr died prematurely of pneumonia in June of 1911 at the age of 36. The business is still listed in the 1929 Brooklyn Red Book but I haven’t been able to find any listings in the 1930’s. Born in 1844, William Sr would have been in his 80’s by then. 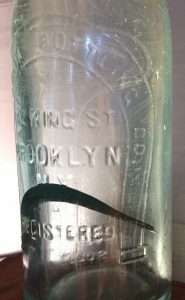 The Brooklyn and Long Island Bottler’s Protective Union has been incorporated by James Ward, Hugh Goodwin, George Russell, William Dieckman, Charles Maurer, John J. Dunn, F.W. Witt, J.F. Knoble, Daniel Bahr, Ebenezer Seely, P. Klein, George Bohlen and Henry Ahrens, of this city; Robert Finan of Long Island City, and Phillip Schweickert, of Coney Island. Today, the Stockholm Street address is a vacant lot. The one bottle I found is machine made, quart size (27 oz) probably from the last decade of the business. I came across a humorous episode involving Dieckman in an item printed under the heading “Court News” in the Brooklyn Daily Eagle. Published in the February 17, 1881 Issue, it occurred early in his career. William Dieckman is a dealer in root beer in the Eastern District, and he left the compound at various candy stores and other places where the stuff is sold. One Frederick Feltman was also interested in the root beer business, and Dieckman charged him with stealing his beer bottles and substituting his own in their place. He caused his arrest, but on the hearing before Justice Semler the complaint was dismissed, because it appeared that the Dieckman business really belonged to Mrs. Dieckman. Then the lady in the case had Feltman arrested on the same complaint, but that case was also dismissed by the justice. Now Feltman took his innings in the game and sued Mr. and Mrs. Dieckman for $5,000 each for false imprisonment and malicious prosecution. The case was tried yesterday afternoon before Judge Reynolds and a jury. The suit against Mrs. Dieckman was dismissed, and in the suit against the husband the jury gave Feltman a verdict for six cents damages. Honors may be said to be easy between the root beer litigants. Back in the late 1800’s it seems like there’s a Consumers Brewery in every town in America. In New York alone I could find the Consumers Star Brewing Co and the Consumers Park Brewing Co, both in Brooklyn. Manhattan had the Manhattan Consumers Brewing Company and the Consumers Brewing Co, Ltd. The Manhattan Consumers Brewing Co, 530 W 57th St, was short lived and out of business by 1905 according to the July 1, 1905 issue of the “American Brewers Review”. It looks like Consumers Park Brewing Co bought it out around that time. 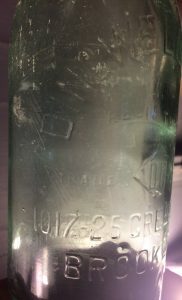 The bottle I found is machine made and most likely made after 1905. An October 6, 1912 advertisement in The “Brooklyn Daily Eagle” touted their lager beer. 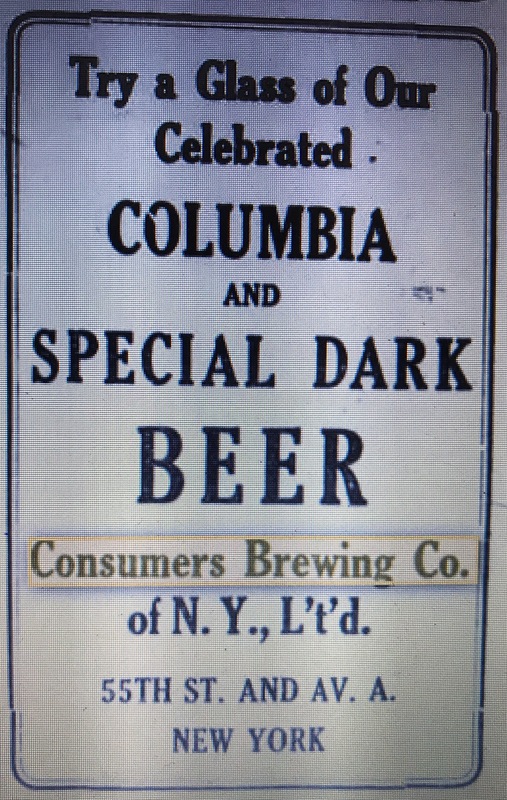 While another in the October 9, 1915 edition of the same newspaper says “Try Our Columbia and Special Dark Beer. Also listed separately in each of the Directories between 1902 and 1915 is the Consumers Bottling Co (RTN) located at 402 E 49th Street. 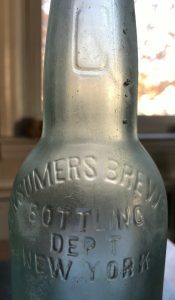 Located about 5 blocks from the brewery, it was probably their bottling operation (or department as the bottle is embossed) although there are no principals listed that were associated with both companies. It looks like Prohibition put an end to brewery operations in Manhattan. 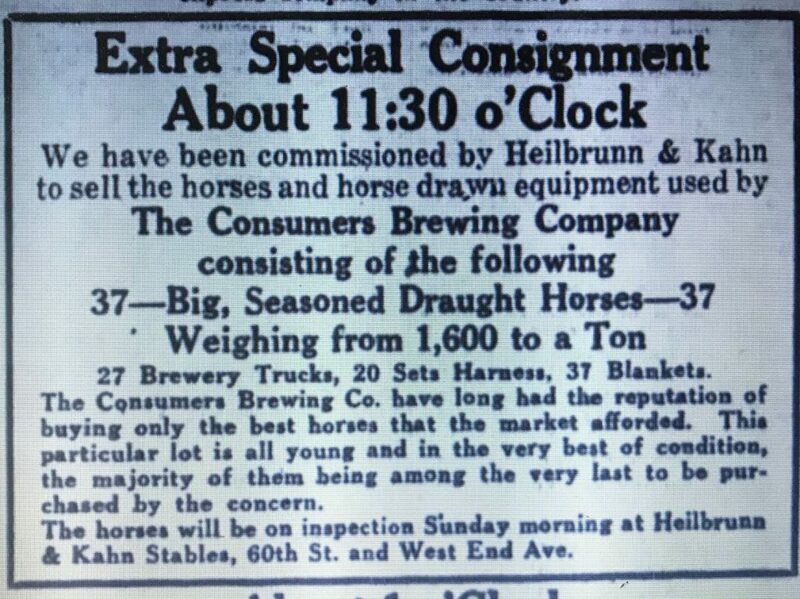 On February 23, 1920, they sold most, if not all, of the components associated with their distribution system, including 27 brewery trucks and 37 horses. The 55th Street brewery complex itself came to an end sometime in the mid to late 1920’s when it was sold to the Tischman Realty Company. A story in the May 27, 1928 edition of the Brooklyn Daily Eagle entitled “Apartment Block for Brewery Site to Cost $6,000,000” told the story. Among the large Manhattan building projects to follow deals closed in the boro during the past week is an apartment structure to cover the block front on the west side of Sutton Pl., from 54th to 55th St., which, it is estimated, will involve about $6,000,000. The site for the building was purchased by the Tischman Realty Co., Inc. from the Consumers Brewing Company, and contains approximately 40,000 square feet. A NY Daily News aerial photo of the Manhattan brewery complex is presented below. The newspaper dates the photograph as 1931, but based on the Brooklyn Eagle story it may have been taken several years earlier. 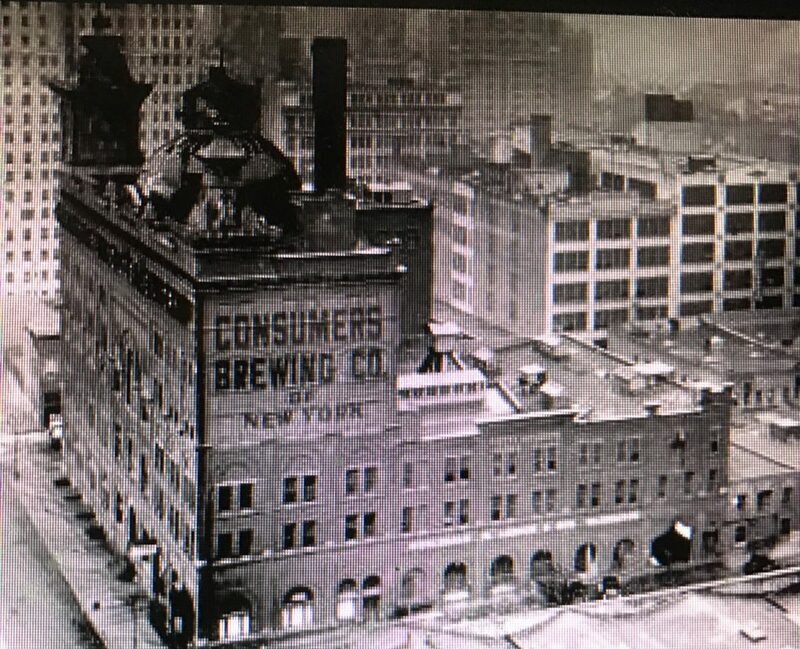 After Prohibition, there was a Consumers Brewing Company located in Long Island City that listed their address as 29-08 Northern Blvd. They were listed at that location as late as 1940. Currently, an apartment building occupies the Manhattan brewery site. According to street easy.com it’s a “white glove” coop that was built in 1955, so it’s not the building that originally replaced the brewery. An office tower occupies the bottling plant. The bottle has an export style and is machine made (12 ounce). According to his obituary in the December 15, 1905 edition of “The American Bottler” Henry Downes was one of the first makers of ginger ale in the US. Henry Downes, the veteran bottler, died at his home, 429 Henry Street, Brooklyn on the 23rd, at the age of 72 years. He was a native of County Clare, Ireland, and came to this country when a young man, and as a pioneer in the soda water business was one of the first manufacturers of ginger ale in this country. He was one of the original members of the Bottlers’ and Manufacturers’ Association of New York. manufacturer of Belfast Ginger Ale, Honey Mead Soda, Sarsaparilla, Fruit Syrups and Extracts; also original manufacturer of Extract of Ginger Ale. He was still listed at that address through 1888. 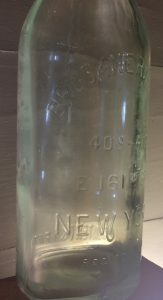 In 1890/91 he was listed as a bottler in Brooklyn at 98 Wycoff Street. He was still listed at this address in 1897 but as an agent, not a bottler. Downes held the rights to at least two patents. One (No. 145139), dated December 2, 1873, and held jointly with Frederick W. Wiesenbrock was for “a fountain for soda water.” The other (196437 A) was for improvements in vent faucets for bottles, Filing Date: May 31,1877, Publication Date: October 23,1877. Another obituary, this one in the November 25, 1905 issue of the New York Sun, said that Downes was a writer and lecturer, and for many years was connected with the Bottlers Gazette. Today this area of First Avenue in Manhattan is heavily occupied by NYU. Their College of Dentistry occupies the former 411 First Avenue address. The 25th Street address is just east of First Avenue and is also occupied by a modern building. The bottle I found is a pony style with an applied blob finish. Its embossed with the date of 1873 which puts it on the bubble between the First Avenue and East 25th Street locations. I’ve seen bottles embossed with the Wycoff Avenue address on the Internet but have not found one. California Bottling Co., 142 King St., Brooklyn, N.Y. The first listing I can find for the California Bottling Co. was in the 1922 Copartnership and Corporation Directory for the Boroughs of Brooklyn and Queens however, based on the patent application below it appears that the business started around 1920. This is confirmed in a June 10, 1920 article in the Brooklyn Daily Eagle that described an accident involving a truck owned by the California Bottling Co. The business continued to be listed in various Brooklyn Directories up to and including 1931. According to 1922 issues of the “Beverage Journal” and the “Soda Fountain” under the heading “soft drinks and syrups” the California Bottling Co patented the design and the word “click” for non-alcoholic, non-cereal, maltless beverages sold as soft drinks and syrups for making same. Used since: February 1, 1920, Filed: February 28, 1922, Published: July 18, 1922 and Registered: October 17, 1922. Starting in the mid-1920’s through 1931, the Click Cola Bottling Company was listed in various directories with the same address and telephone number as the California Bottling Co.
I’ve seen bottles on the Internet embossed Click Cola (in script) Bottling Co., with the 142 King Street address looking very much like a classic Coca-Cola bottle. An Internet bottle site stated that Coke sued them for infringement and put them out of business. I can’t confirm this. Today 142 King Street is a one story building with two garage door size openings. Property Shark.com states that it was built in 1931 so it was most likely not utilized by the business. The bottle I found is machine made (8 oz) with California Bottling Co embossed inside a large horseshoe. There is no mention of “Click” Cola. It fits with a mid 1920’s time frame. The NYC Copartnership and Corporation Directories listed the Bruckner Brothers as John A and Henry Bruckner. The business bottled mineral water and soda. Henry was also a prominent Bronx politician serving as an Assemblyman in 1901, Commissioner of Public Works from 1902 to 1912, a Congressman from 1913 to 1917 and Bronx Borough President from 1918 to 1933. Bruckner Boulevard and the Bruckner Expressway were named after him. 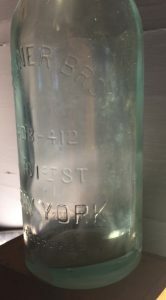 An early Bruckner Bros bottle listed on the Internet is embossed “Successors to Stephen Garland.” Garland was listed as waters in the Directories between 1875 and 1892. He was located at East 163rd Street near 3rd Avenue through the mid 1880’s, and at Elton Avenue and E 162nd Street until 1892. Bruckner Bros was first listed in the 1894 NYC Directory in the same neighborhood at 668 East 161st Street so they must have purchased and moved the business sometime in 1892 or 1893. Sometime between 1906 and 1908 they moved to 408 East 161st Street and continued to be listed at that address throughout National Prohibition. In the 1940’s they were still located there but had changed their name to Bruckner Beverages. Henry Bruckner died in 1942 but the business survived through most of the 1950’s. In 1957 they were listed at 450 Thompson Place. The “American Bottler” contained the following story of a robbery that occurred at the business in July, 1917. The story gives a little insight into Henry Bruckner’s sense of humor. Sweet are the uses of adversity. Sometime during the night of July 28th last, burglars forced an entrance to the soda water plant of Bruckner Bros., at 412 East 161st Street, New York City, and blew a large safe in the office on the second floor, securing $1,000 in cash and a number of checks. They then went to the private office of Congressman Henry Bruckner and blew the safe there, securing a number of checks. Turning his misfortune to advertising account Mr Bruckner immediately furnished the local newspapers with the following copy. Burglars recently robbed the safe in the establishment of Bruckner Bros. The cracksman drank several bottles of ginger ale before departing. It must be good. Try it. Sold by first class grocers, delicatessen dealers and confectioners in the Bronx. Interestingly, Henry listed himself as sole proprietor in the above story but two years later, the 1919 Copartnership and Corporation Directory continued to list both Henry and John as principals. The 1925 NYC Directory listed the business as Bruckner Bros., but only named Henry Bruckner. I guess it’s safe to say that John left the business at some point during this period. 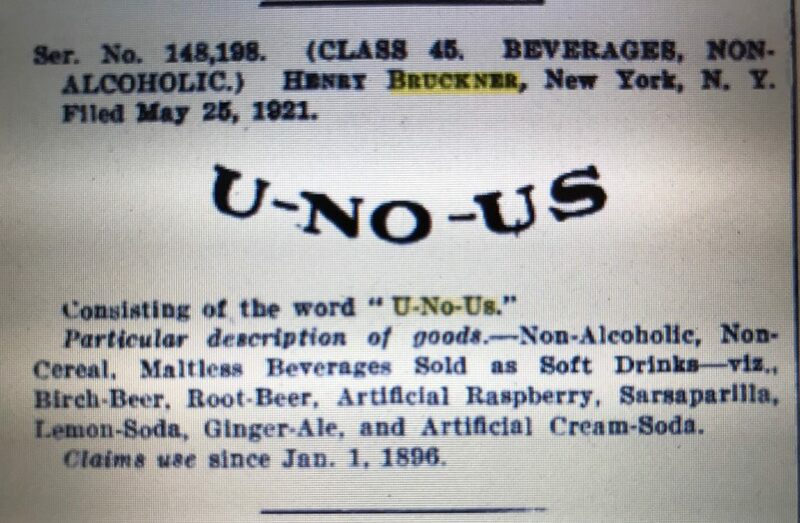 In 1921 they registered the U-NO-US slogan as a trademark (No.148198; Published Date Sept. 27, 1921) although they claimed to have been using it since 1896. They describe the product as non-alchohlic, non-cereal maltless beverages sold as soft drinks. This was their big seller during the prohibition years. 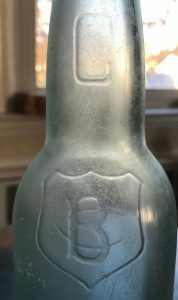 I’ve seen bottles listed on the Internet with “U-NO-US”embossed in large letters below the shoulder and the company name and address in smaller letters near the base. 408 to 412 East 161st Street is located in the Morrisania section of the Bronx, about 10 blocks east of Yankee Stadium. The former addresses are now encompassed by a new apartment building that takes up the west end of the block on the south side. The bottle I found is a 28-ounce, machine made crown. It has the 408 to 412 address embossed on it but does not have the U-NO-US trademark. They were using this trademark as early as 1916 and it apparently was popular during Prohibition. This leads me to believe the bottle was made before the trademark really caught on; say sometime between 1915 and 1920. It was found with the porcelan stopper still in place but no wire bail. 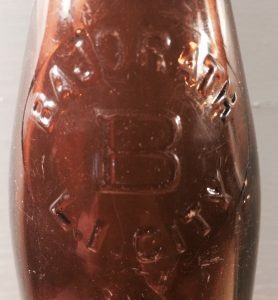 Charles Bajorath appears to have been a small-scale bottler of lager beer that worked out of his residence. According to the 1910 census records he immigrated to the U.S. in 1886 but the first mention of him in the NYC Directory was in 1892 as a bottler with just a home listing at 428 E 92nd Street. Subsequently, he was listed sporadically (1903 Trow Business Directory and 1909 City Directory are the only listings I could find) as a beer bottler at 1735 Second Avenue. In 1910 he moved to 461 Washington Avenue in Long Island City. 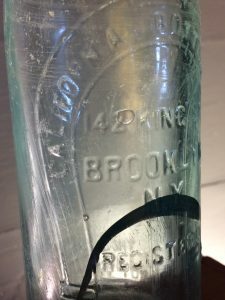 The 1910 Census Records indicated that he had a beer bottling business that he ran out of his house and the 1912 Queens Business Directory listed him as a bottler of lager beer at the Washington Avenue address. In addition, the Annual Report of the State Commission of Excise listed him as a liquor tax certificate holder for the years 1911 and 1913. He was listed in the 1920 Census Records (name spelled incorrectly) but at this point he’s in his 70’s and did not list a business or occupation. Washington Avenue was later renamed 36th Avenue in Long Island City. I can’t relate the No. 461 to any specific block. The bottle I found is a brown champagne style bottle. It has “L. I. City” embossed on it, dating it to after his move to Long Island City in 1910. Interestingly it is machine made but has a blob finish (almost all machine made beer bottles that I’ve found have a crown finish).